A lot has been going on here, but pretty much everything pales beside the specter of the Western North Carolina wildfires. What's happening to the Blue Ridge Mountains and the wildlife there is absolutely tragic, and the heroism of the men and women fighting the flames cannot be overstated. We're currently in what's been classified as a Red Zone for "unhealthy" air quality due to the smoke and ash. - I was interviewed for this article by Tiffany Gee Lewis of The Deseret News: The Cultural Impacts of Harry Potter on the Next Generation." - My latest "Looking Back on Genre History" segment, which focuses on the work of Sheri S. Tepper, is up on the new episode of StarShipSofa here. If you listen, I hope you enjoy! - Here are a few Calls for Papers that may be of interest. --- Serenity: Essays on Joss Whedon’s "Big Damn Movie"
Lastly, on my trip to speak in D.C. a couple of weeks ago, I stopped off at one of my favorite places in the world, The Poe Museum. 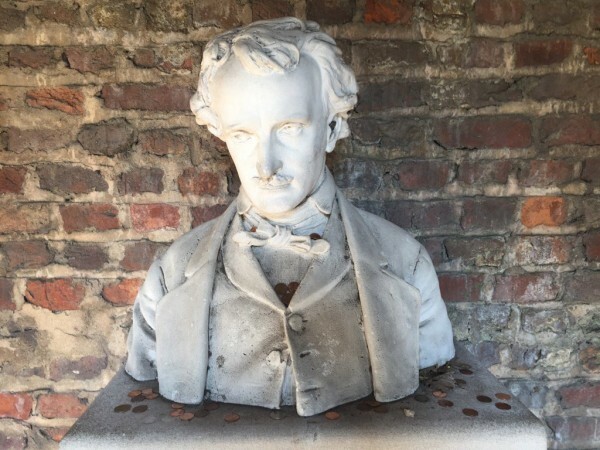 Here's Poe in the Poe Shrine, with the morning's pennies left by visitors. Good stuff! We have air quality warnings here as well. Firefighters are brave people! on a positive and lovely note, how many wonderful things you are up to of late. Congratulations! The fires are heartbreaking. There's a $10K reward for those responsible. It's hard to believe that people did this, but the authorities are saying these blazes appear to be manmade. I wonder how they would feel if someone burnt their home to the ground. On purpose. I hope that you and yours can stay safe, and that the environmental damage can be limited. A few years ago, we visited a temple of Mithras near Hadrian's Wall. Previous visitors had left monetary offerings. We had no idea his cult was still active! That Harry Potter article made me feel so old! It reminded me of an experience I had this week. I smiled the other day when, as I was leaving, the dad of the 3 year old I watch said to him, "Do you know who Harry Potter is? I'll have to tell you about him." Something which might be of interest. A while back, I started following this series of shorts called Miss Bernard Said. This summary I came across describes it quite pithily. I'm also betting you've had students like this. The premise is that Miss Bernard wants to appear well-read to her fellow library friends, but she doesn't actually have the patience to read any of the long-winded classics she wants to brag about, so she just sort of guesses what the books are about, and her friends either roll their eyes or get nerdily indignant about her terrible improvised cliff's notes, and we all maybe learn a little about literature (or don't). Will definitely download that ep. of the Sofa to my iPod & listen pronto! Sheri S. Tepper is SO missed . . . . Thank you for featuring her work.